Ameen is using Smore newsletters to spread the word online. 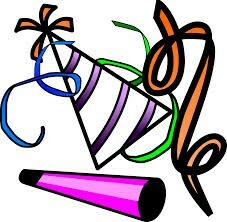 Burger Bonanza charges $10 per person plus a $20 catering fee. The $10 in the equation is our rate of change, or slope. Our Y-Intercept (or b value) is $20. So in all you should have y=10x+20. 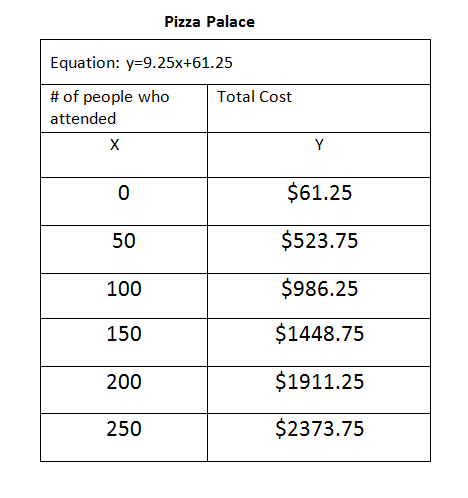 Pizza Palace charges $9.25 per person (our rate of change) plus a set up fee of $61.25 (y intercept). Using those numbers, you come up with an equation of y=9.25x+61.25. 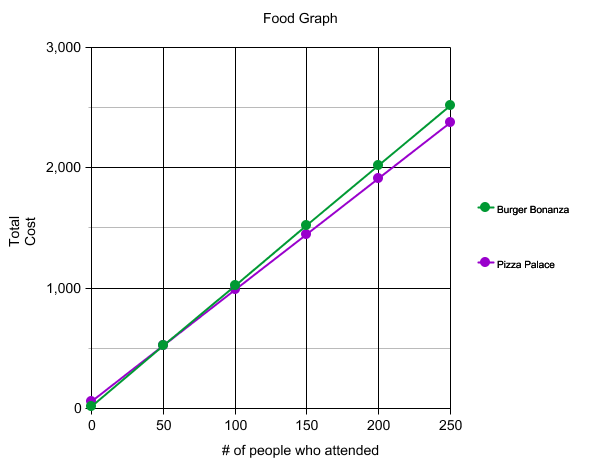 To graph your table, you plot each coordinate from your table on your graph. Eventually you'll be able to draw a linear line through these coordinates. In our case, we have two lines, so you will have a point of intersection. That is where the two linear lines cross. To find a more accurate point of intersection, you have to put the two equations equal to each other. For us, it's 10x+20=9.25x+61.25. You solve that to get 55. You'll see that on the graph. 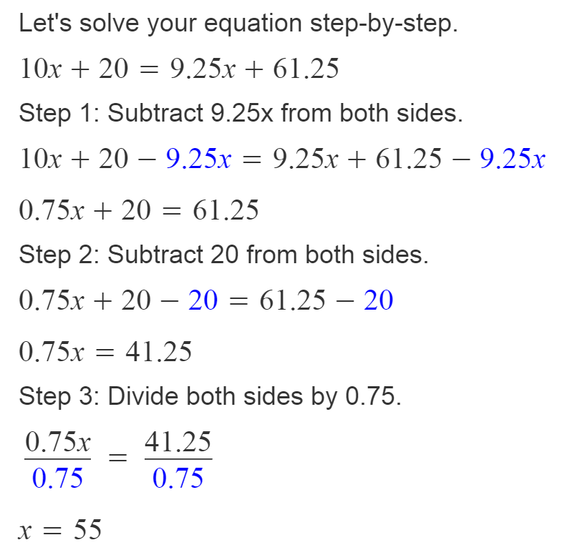 1) Describe how you created each equation. I created the equation by using y=mx+b (or y=kx+b) format. The rate of change was found in the flyers of each restaurant. The Y-Intercept was the catering/set-up fee. Now that we have both our ROC and Y-Intercept, you can create the equations of y=10x+20 and y=9.25x+61.25 for the restaurants. 2) Will there ever be a number of students where both companies will cost the same? 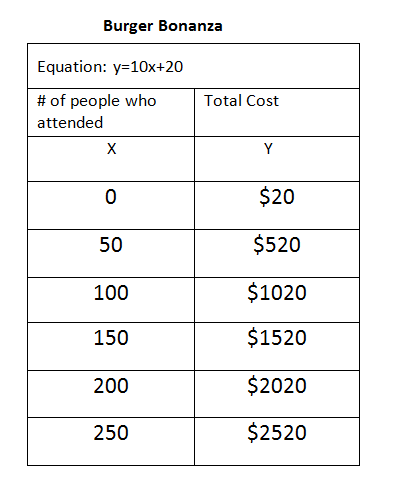 Describe the steps you would use and then solve for the number of students for which both companies will cost the same amount. 3) If you only have a budget of $1000 for food, how many people, maximum, would you be able to have at the 7th Grade Blowout for each company? Can you have a decimal or fraction as part of your answer? Why or why not? Basically, this question is asking what the x will be if y=1000. For Burger Bonanza, your equation would be 1000=10x+20. If you solve this, you should get 98 people attending. You can't have a decimal as your answer b the y=1000, you cannot round up. Same applies with Pizza Palace, the equation would be 1000=9.25x+61.25. Although you have a decimal for an answer, you cannot round up. So you'd be forced to round down and get x=101. 2) Will there ever be a number of hours where both companies will cost the same? 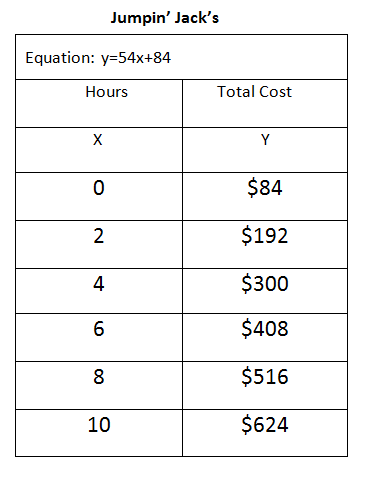 Describe the steps you would use and then solve for the number of hours for which both companies will cost the same amount. 3) If you only have a budget of $750 for the bounce house, how many hours, maximum, would you be able to have at the 7th Grade Blowout for each company? Can you have a decimal or fraction as part of your answer? Why or why not? 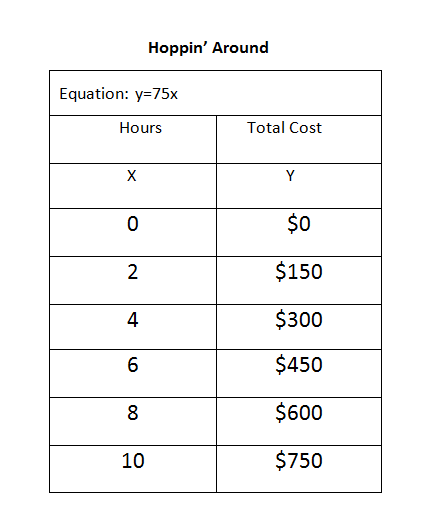 Basically, this question is asking if y=750, then what would your x value be. 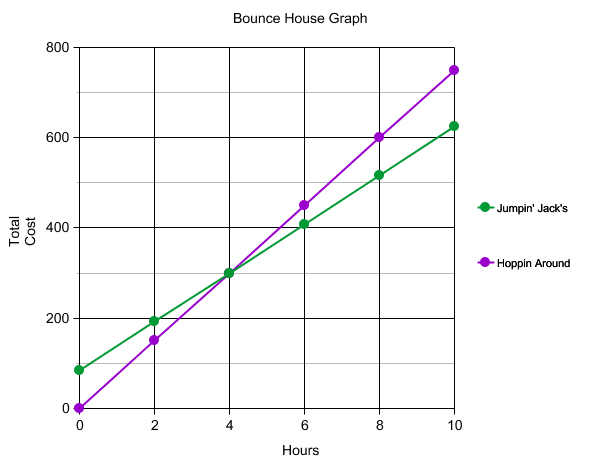 For Hoppin' Around, you would have to create the equation 750=75x. 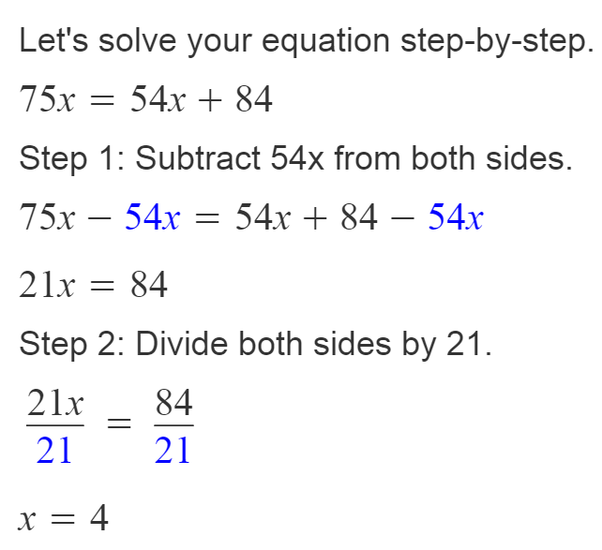 To solve this, you would have to divide 75 from each side to get 10=x. This means to spend $750, you can rent it up to 10 hours without exceeding. For Jumpin' Jack's, you would have the equation 750=54x+84. After you subtract 84 from each side, you get 666=54x. Now you divide 54 on each side to get 12.333 (infinite)=x. You cannot round up, or it will affect the dependent value, (Total Cost) You must round down to 12=x to spend a little less than $750. For food: If there are 54 people attending or less, I DEFINITELY recommend Burger Bonanza for a cheaper price. Although, if more than 55 people are attending, you should choose Pizza Palace for the cheaper price. That is caused from their intersections. For the bounce houses: If you are renting it for 3 or less hours, you should DEFINITELY go to Hoppin' Around for a more cheap price. Although, if you are renting more than 4 hours, you should choose Jumpin' Jack's for the better price. Once again, this is all caused by their points of intersections.